Preheat oven to 375° F. Season both sides of the filets with ½ teaspoon kosher salt and ½ teaspoon freshly ground black pepper and place in a large dish or Ziploc bag with the buttermilk, coating them all around. Let marinate for 15 minutes, but note that the acid in the buttermilk will start cooking the fish if left too long. Line a baking sheet with tin foil and place a cooling rack on top. Lay bacon on the rack, ensuring none of the pieces are overlapping, and bake for 15 minutes. If you don’t have a rack, just place the bacon directly on the tray. Remove from the oven and drain on paper towel. When cool, crumble into bite-sized pieces. Combine cornstarch and tapioca flour in a high-sided dish. Remove the filets from the buttermilk, one at a time, draining off any excess and place them in the flour mixture. Coat filets well on all sides by flipping them in the flour mixture several times. Heat a large heavy-bottomed sauté pan over medium-high heat and add the canola oil. There should be enough oil to cover the bottom of the pan by ¼ inch. Once the oil is very hot (it should look liquid and be shimmering, almost smoking but not quite), add the fillets and cook until golden brown and crisp, about 2-3 minutes. Do not overcrowd your pan. There should be approximately 2 inches around each filet. If the pan is too small, cook the tilapia in batches. Gently turn fish over and cook until the other side is golden brown and crispy on the outside and warm and flakey on the inside, about another 2-3 minutes. Combine all ingredients. Taste, and season with salt and freshly ground black pepper as needed. Season all of the salad ingredients (except the bacon) with salt and freshly ground black pepper to taste. Arrange the lettuce on two plates. Layer the tomatoes, hard boiled eggs, red onion, scallions, and bacon over the lettuce. 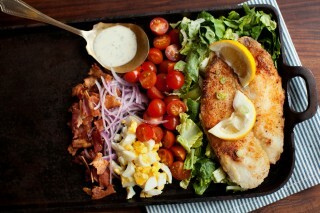 Top with the crispy tilapia and drizzle with ranch dressing. Season with salt and pepper as needed.